Everyone knows that High Sierra is packed with epic musical moments, but there’s plenty to be discovered away from the stages, too! Past examples below. Check back in Spring 2019 for 29th Annual activities. Giant Puppets Save the World is bringing an epic display of interactive parade art to 2018 HSMF! Come pick out a silly costume from the Goat Barn an hour before the parade starts or wear your brightest funkiest craziest regalia to puppeteer a giant silk bird kite, wave a silk flag, march inside a huge dog or don a backpack puppet. NEW THIS YEAR! GPSTW is bringing it’s very own dixieland New Orleans-style marching band comprised of Bay Area musicians! BACK THIS YEAR! 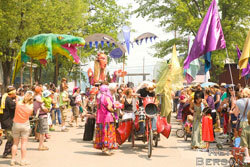 In the Parade’s Goat Barn will be a Giant Puppet Maker Lab led by Parade Director, Toni “Tone” Mikulka. Come and connect with parade people or see it as it is all coming together. For the full parade activity schedule look here: tinyurl.com/HSMF18Parade. Connect with the parade people or see it as it is all coming together, follow Giant Puppets Save the World on Facebook/Instagram. 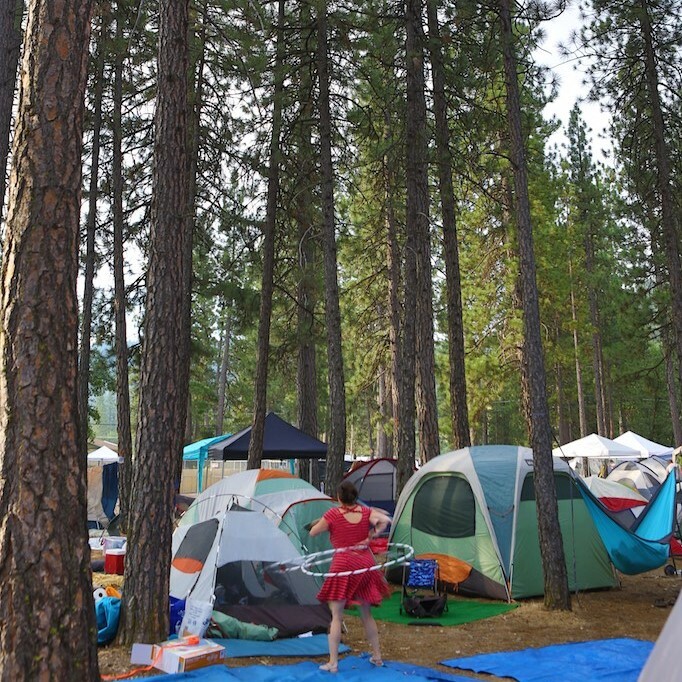 Prepare yourself for another glorious day at High Sierra and show your mind and body some love with a variety of movement classes for every body and level of experience. 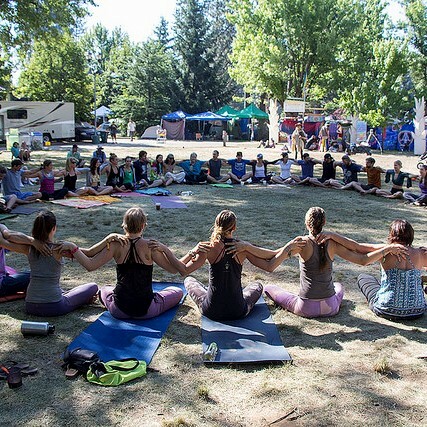 All hour-long classes are held on Friday, Saturday and Sunday on the lawn between the Food Court and the Grandstand Meadow entrance (unless otherwise noted in the festival program). See complete class descriptions here. Liven up the night and join us Friday evening for the Glowing Night Parade! Meet at the Parade Staging area (see map) and we’ll march right on through the main stage field during String Cheese Incident’s set. Festivaaalll! Bring your blinkies and wear white! Starts at 11pm! 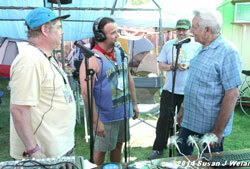 discos at High Sierra or at other events. We look forward to enjoying late nights and kickball with you all! 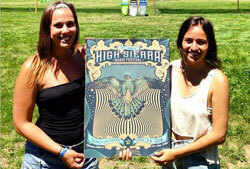 From the very beginning, the art that enhances the High Sierra experience has been created by hand and installed with love by fans of the festival. We’re always on the lookout for talent, so if you are the creative type and would like the opportunity to see your work displayed on one of the High Sierra stages, please contact us. Several favorite stage sets and late night themes over the years were created by High Sierra fans who had never done large scale artwork before, but were inspired by the festival and went for it… with beautiful results! 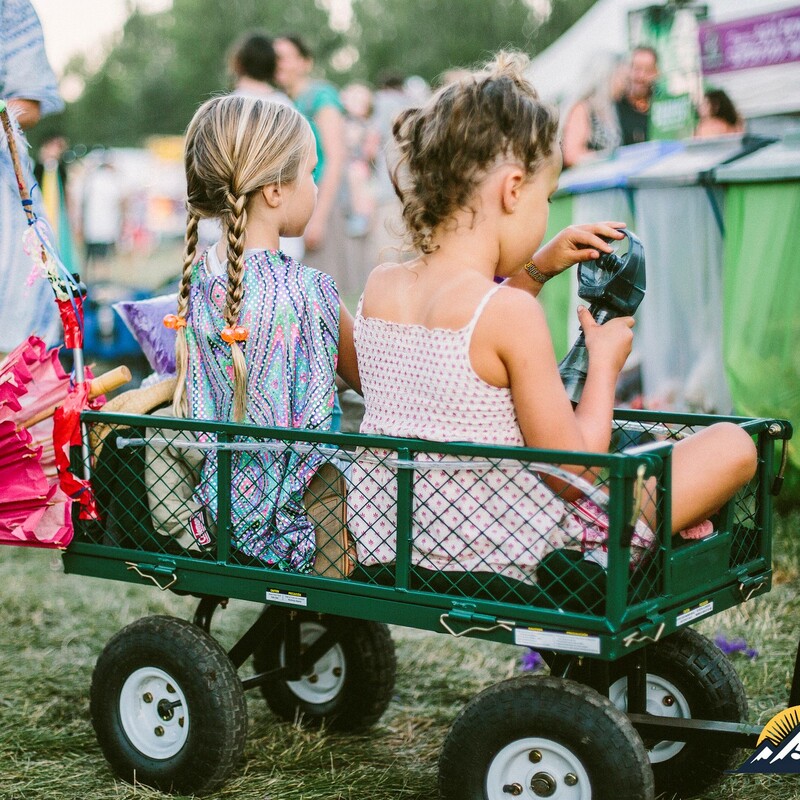 We encourage all festival patrons to enhance their festival experience by decorating their camps and creating fun fashion ensembles! 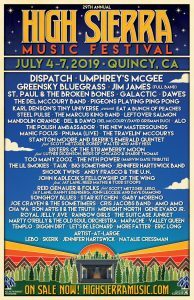 Once again, Grizzly Radio will be providing a live and direct broadcast of the festival via low-power FM throughout the Plumas County Fairgrounds. This year, those broadcasts are available on some Android-enabled smartphones via the NextRadio app, downloadable from the Google Play store. 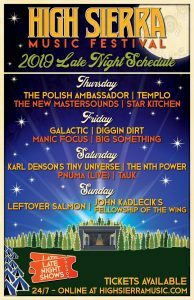 Tune in to these frequencies 24 hours a day to hear live music from the stages, festival info and epic archival recordings! Sing for your breakfast! Show off your radio-ready talent at Morning Sushi and get a free breakfast, 7:30am-10:30am in the Mineral Building. Not just for musicians…comics and other performers are all welcome to perform up to 15 minutes each. 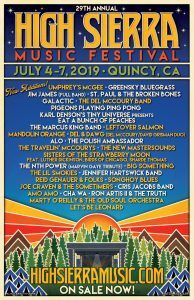 Sign Up at the Grizzly Radio tent near the Grandstand stage Thursday through Saturday at 2pm to perform live, on-air for the following morning! Our Merchandise Tent is located in the Grandstand Meadow. Here you’ll find a wide variety of High Sierra wearables for adults and kids as well as souvenir ceramic mugs, pins, and posters. Music and other merchandise from many festival performances will be available as well. 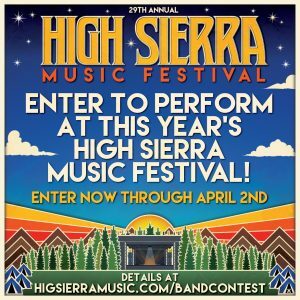 New this year: High Sierra is partnering with MerchHub offering Will Call merch pickup as well as shipping! Place your order here, and pick it up at a more convenient time later, or have it shipped directly to meet you at home. LOST & FOUND and Late Night Tickets are also located at the Merchandise Tent. 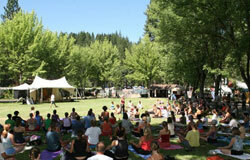 Each year, High Sierra Music Festival and Conscious Alliance host an “Art That Feeds” Food Drive at the festival. Interested in participating? The first 200 patrons who donate 20 non-perishable food items will receive a FREE limited-edition High Sierra “Art That Feeds” poster! 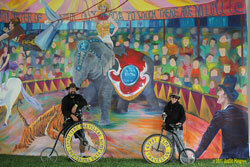 Food donations will be collected at the Conscious Alliance ”Art That Feeds” Gallery in the Grandstand Music Meadow. Conscious Alliance always encourages food donations to be low-sodium and health oriented products. ORGANIC food donations are especially encouraged. RAMEN NOODLES will NOT be accepted for the free poster. Most-needed items include: canned soups and stews, pasta, tomatoes and tomato sauce, rice, canned fruits and vegetables, tuna, oatmeal, whole grain/low sugar cereal, peanut butter, beans, baby food. Thank you for your continued support in feeding the hungry in Quincy, and everywhere the music plays! 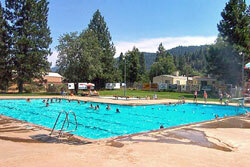 Just a block away and a short walk from the festival site, Pioneer Pool is the largest public swimming pool in Plumas County and a great place for a refreshing swim. The capacity of the pool is limited, so please be considerate if others are waiting. There are fees to swim and use the showers. Please bring cash – rates are posted at the pool.